Capulin Volcano is not one of the Southwest's major attractions, partly due to its isolated location in the far northeast corner of New Mexico, well away from other popular destinations. The land hereabouts is a transition zone between the high plains of north Texas-west New Mexico and the foothills of the Rocky Mountains, containing mostly arid prairie, used for cattle rather than agriculture, and crossed by numerous small ravines and washes, with occasional hilly outcrops. 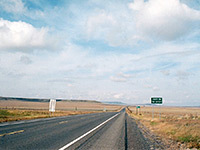 The hills and mesas become higher further west, and the region between Clayton and Raton additionally has many scattered volcanic peaks - dormant volcanoes and cinder cones, all part of a great line of vulcanism stretching from southeast Colorado into Arizona, including the El Malpais lava field and the Valley of Fires. Most of the peaks are quite small, rising just a few hundred feet above the plains, but one of the largest and best preserved is the 1,000 foot high Capulin Volcano, located between the small towns of Folsom and Capulin, and proclaimed a national monument in 1916. The nearest towns with hotels close to Capulin Volcano National Monument are Clayton (57 miles) and Raton (32 miles). The Capulin Volcano is just off US 64/87, the main highway across this part of the state, linking the Texas panhandle with I-25; the village of Capulin is 27 miles from the interstate and 62 miles from the TX/NM border. There is not much traffic on the back roads in this corner of New Mexico, though all the land is still used, privately owned and fenced off, hence finding a free campsite is not so easy. One possible place is along a side track off highway 72 a few miles west of Folsom, which is a sleepy farming town 10 miles north of Capulin. Folsom is famous as the site of the most significant archaeological discovery in the US, when, following a large flash flood in Wild Horse Arroyo, a local resident (George McJunkin) discovered a large number of bison bones, some with embedded stone spear heads. The bones were later dated at 10,000 BC, which doubled the length of time man was known to have inhabited this continent. The town has a small museum, not always open, with exhibits about the discovery of 'Folsom Man'. The Capulin Volcano is 6 miles south of Folsom but clearly visible for many more miles across the surrounding grasslands. , which loops through woodland, meadows and occasional patches of overgrown lava for 2 miles, but the main activity here is to drive the road to the top of the volcano then walk along the loop path on the crater rim. The road curves 360° round the peak, ending at a parking area 600 feet above the visitor center, at the lowest point of the rim on its west side. Prevailing winds during the last eruption around 60,000 years ago pushed cinders more to the east, so the east rim is up to 300 feet higher. The sides of the volcano are quite densely covered by pinyon/ponderosa pine trees and juniper bushes, unlike most nearby volcanoes, and even the top of the rim is often overgrown though all growth is quite stunted here due to poor soil quality and lack of water. Opuntia cacti are found even at the highest point (8,182 feet). The one mile rim trail is steep in parts, though short, but often more difficult than might be expected due to frequent strong winds and the high elevation. 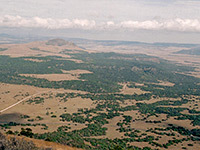 The rim offers good views of distant lands in all directions, including various lava flows, now mostly grass-covered and difficult to identify from ground level. Another short trail descends into the shallow crater. The volcano is best photographed from a distance, such as from Capulin itself, along the main highway. This is another sleepy town, with a selection of abandoned buildings.